Play addition math games to find out how many components make up a thousand! It’s time to pop some numbers and find out! Tap Thousand brings together the adventure of exploring expanded form with the fun of breaking a single thousands cell into groups of hundreds, tens, and ones! The Zapzapmath scientists require your advanced knowledge in addition math games. They need you to break the cells and use addition to assist in their latest study on learning the numbers that form up to a thousand. There are some very happy molecules waiting to be reviewed as part of the experiment. 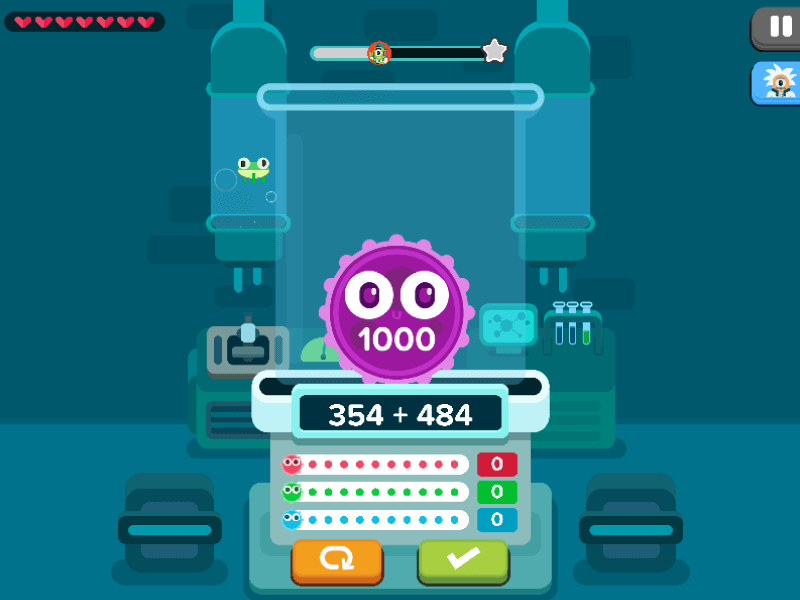 To play this game and assist the cells in determining exactly how many forms of smaller values they are made out of, you are required to bring your best tapping skills to the screen! Start each level by examining the number shown on the control panel. Adding up the different cells can be tricky, but patience is key. Once you are ready and have your answer in mind, tap and hold on the cells to break them down into groups of hundreds, tens, or ones. With the answer in mind, start breaking down cells. The purple cell indicates a thousand as a whole. It can be broken down to three stages: red, green, and blue. The red cell represents hundreds, which can be broken down to green cells; the green cell represents tens, and can be broken down into blue cells; the blue cell represents ones, and cannot be broken down any more. Once you have a grasp on the colors and representations of each cell and its total value, it is time to get adding! To combine the cells to get the total that you require, add the cells up accordingly. As you tap your answer in by cells, the bars located on the control panel will fill up based on the individual cell. This provides you with a clear indication on the breakdown of your cells and your total answer. If you are satisfied with the total that you have concluded, click on the green check mark to reveal the results. The right result will amount to success! However, addition and subtraction can be very tricky. If you make a mistake, do not worry! To fix a mistake, return the cells to their original state by tapping on the orange button next to the green button. You can do this as many times as you need, so just keep trying until you gain success! With addition math games such as Tap Thousand, you will be counting, adding and subtracting up to a thousand. There are two ways to view total values: Standard Form, and Expanded form. Standard Form is seeing a value as a whole, whereas Expanded Form breaks that whole value up into parts. This helps explain the role of each number in a total value. It is common practice to view numbers in Standard Form, no matter how big the total. However, Expanded Form trains you to recognize the meaning of each number within the total value, improving critical thinking skills and exposing the thought process to a wider perspective on equations. Tap Thousand also trains your subtraction and addition skills. The goal of addition math games is to exercise the identification of numbers as building blocks. By exploring numerical values in both objects as well as digits, players will learn to inquire through different forms of concepts. This generates a broadened perspective on math as a whole. It’s time to break math down to pieces!